Please come in, relax, and savor the taste and smells of Hand Crafted Perfection. 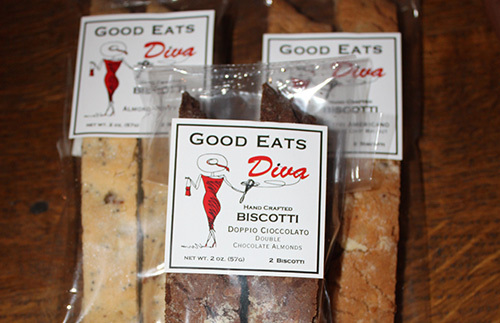 The Good Eats Diva invites you to experience the flavor, texture and essence of her legendary biscotti and other offerings. Come visit us at our new Bakery and Cafe in Haslett! Everything is made in small batches with the highest quality fresh ingredients, natural flavorings and no preservatives, creating the most distinct and outstanding taste. Time is taken to make Biscotti loaves that are rolled, shaped and cut by hand to create a truly authentic product – the real deal! Because the biscotti are hand cut, the sizes of each cookie vary slightly in width and length. Biked to the Farmers Market in Okemos this morning. Had to stop by the Good Eats Diva tent. They always have wonderful treats my family loves. The ginger/molasses cookies are excellent. We love her Biscottis (almond lemon poppy especially). Her Breakfast bar is delicious and thank goodness she had cold waters in this heat. Kathleen is so friendly and knowledgable. Love to go when I have time, still haven’t tried all her treats, but look forward to them. When one possesses the good fortune of time and opportunity, the process of combining a cup of steaming coffee and several sturdy samples of spicy stout and chocolate biscotti, there then comes a moment to be savored. The background recedes, replaced by crunching, sipping, and smiling. With thanks to the Diva.